For fun, practical save the dates, look no further than save the date magnets from Invitations by Dawn. Our customizable magnet save the dates come in a variety of styles to match your wedding's theme. 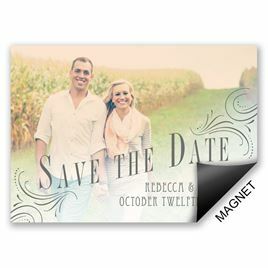 Our save the date magnets also come in a variety of fun colors. If you can't find the save the date magnet you're looking for, we offer standard save the dates in a variety of themes and styles as well. No matter the wedding you're planning, Invitations by Dawn is committed to helping find the right wedding accessories, so shop magnet save the dates and more today. I ordered Save the Date magnets and wedding invitations. Designing them was easy and fun - enough options to make me happy. Customer service was excellent. Delivery was prompt. Thanks to all at Invitations by Dawn! Just received these in the mail. We chose the magnet option, and it's perfect! It looks ver Rich and elegant, and the magnet gives it a nice weight so it doesn't feel thin and cheap. We are thrilled with these!! My fiancee and I went through many websites, and when I came upon this one, the search ended. We picked this magnet because it wasn't over the top fanciness, it was just like us.....cute. Lol The delivery was fast and I have no complaints. Now my problem is to find invitations, because we need to send them out soon. So these were my save the dates for my wedding!! I really loved the use of different fonts and colors as I was able to match my wedding color scheme. I didn't like the font may have been a tad small but overall it really didn't bother me. It was still readable and they were beautiful! !